I’ll cut to the chase. 2017 was one of the worst years of my life. I’ve tended not to talk about my own personal mental health issues, but over the last few years, they keep interfering with my ability to put out creative content, and I feel it’s about time I offer an explanation. I’ve long had issues with depression and especially anxiety, but I’ve also had a tendency to deny it to myself. This has not made for a good combination. Social stigma against mental illness is a real issue and, while I have been vocal against it and in defence of others with mental illness, I have applied that stigma to myself. I have felt ashamed of my anxiety and of myself. So while I would admit to a bit of anxiety, I would deny the extent of it, deny any depression entirely, and pretend everything was just fine. This has led to all kinds of obstacles in life, both professional and social. This most recent absence from this blog was not the first due to things like imposter syndrome getting the better of me. The fact that my spouse had health issues (both physical and mental) made it easier to pretend my own didn’t exist. I could focus on providing support for her because I could consider her issues more important than my own, and thus mine didn’t need any attention. But through all that time, my issues were bubbling under the surface. My spouse and I separated in December 2016 and we broke up completely the following April. I no longer had a shield against my own problems and I spiralled into the worst depression I have ever had. 2017 was hard, so very, very hard. It didn’t help either that my financial situation was in a critical state. More than a few times I feared losing everything I had. But on the good side, it did make me realise that I needed help. I’ve been seeing a very good therapist since January 2017 and I’ve made a lot of progress. Things are still far from perfect, but I’m in a much better state than I was a year ago, and I think I might be ready to face the world again and, in some ways, face it for the first time ever. In particular, I’m hoping to be able to work past my imposter syndrome when it comes to my writing and get not just this blog back into shape, but also kick my hopes for a professional writing career into first gear. I don’t expect there to be no stumbling blocks along the way—there absolutely will be (just this past week, I’ve had another depressive bout brought on partly by a stressful trip to visit family)—but I hope I can work for real change in my life. First, however, over the past couple years, I’ve let a number of people down. There are several things I promised to write for people that I never completed, from reviews of products that I received a complimentary copy for, to assorted general posts. To these people, I offer my sincerest apologies. I can’t really erase the past, but I can strive to do better in the future. I hope only that people will be understanding and offer me that chance. So, what does all this entail for the future of Of Dice and Pen? Well, I’ve already posted my review of “The Doctor Falls”, the finale of Doctor Who Series 10. My review of December 2017’s Christmas special, “Twice Upon a Time” should be up in the next few hours, or tomorrow at the latest. I’ve got a ton of Pathfinder material to gradually get through and review, including finishing the Giantslayer Adventure Path, which I had begun reviewing before my most recent absence. I also want to expand this blog beyond mostly Pathfinder and Doctor Who. I’ve always intended to include more diverse science fiction and fantasy topics, but rarely managed to get round to it. I’m not sure how successful I’ll be this time, but I have a fantasy novel review written (just needs an editing pass) that will be going up in the next day or two. Most exciting for me is that I will soon be officially announcing a call for beta-readers of my own novel, The Child of the Volgs! I’ll have full details in a few days, but for now, this is just a little advance warning. Of course, over the last year, I’ve missed a number of big announcements that I would normally want to comment on. In fact, I would still like to comment on many of them. I don’t know how quickly I’ll get to them (time constraints may mean I don’t get to them at all), so I thought I’d offer some quick comments on two of them. Jodie Whittaker as the 13th Doctor: Super excited! It’s overdue time we had a woman Doctor, and I think Whittaker is perfect casting. 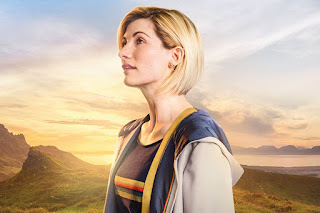 I’ve seen and loved a lot of her other work (Broadchurch probably being the most well known, but seriously, you should check out Adult Life Skills, which is a brilliant movie), and I can’t wait to see her take on the Doctor. Pathfinder 2nd Edition: I’m not as excited about this. I’ve been paying attention to many of the previews, and I like some of what I see and dislike some other things. However, it also seems to be a much bigger change than I want at this time. I still have a ton of Pathfinder books that I’ve never had the opportunity to use (particularly Adventure Paths I want to run) and the amount of conversion effort it appears will be needed to change them to 2nd Edition is more than I care to give at this time. Still, I’m approaching it with an open mind, and could well change my opinion by the time it releases in August 2019. Anyway, that’s all for now. Thank you to all of you who read this blog and my writing. I appreciate you all. Have a happy Pride Month! So glad things have been going better for you and so happy to see your words again. Wishing you all the best moving forward. It's good to be back. Thanks!